What on earth is togarashi I hear you cry? It’s a Japanese combination of spices which is warming with a citrus note so it is perfect with salmon and chicken. This recipe allows the togarashi to speak for itself so keep it simple, there’s no point using such a great ingredient if you can’t taste it! I bought the mix at http://www.souschef.co.uk so give it a go and keep in the cupboard for a quick dinner fix. 1. Start off by lining a baking try with foil and drizzling a small amount of vegetable oil over it to prevent the salmon from sticking. Nobody wants salmon that’s been wrenched off the tray! Combine the soy, mirin and honey in a small bowl and marinade the salmon for between 20- 30 minutes. 2. When you are ready to cook the salmon, simply remove the fillets from the bowl and place on the tray. Sprinkle over the togarashi before popping in the oven on a 180c/ 160 fan heat for 15-18 minutes until the salmon is cooked through. Serve with noodles or rice and a side dish of your choice. Asian greens that have been lightly stir fried and finished with a little sesame oil are delicious here. 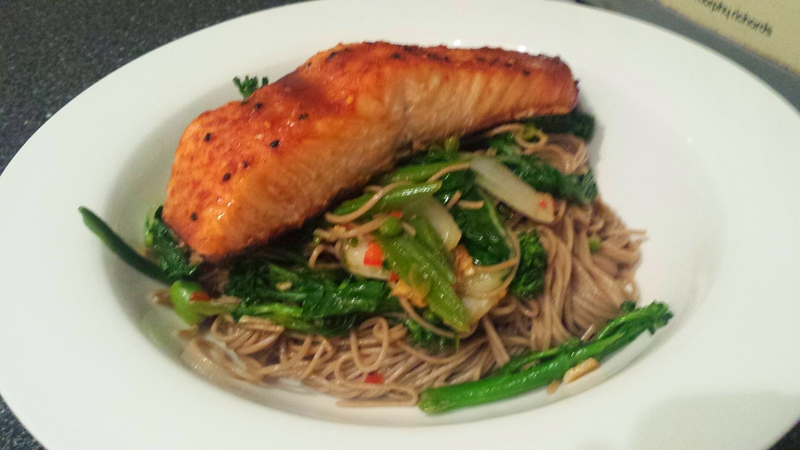 Togarashi salmon- quick, easy and a great introduction to a new combination of flavours! Now’s your chance to broaden your culinary horizons and try tantalisingly savoury Japanese dishes. If you think Japanese is just sushi then read on and try something new. 1. You need to start this recipe ahead of time so plan when you want to cook it and work back from there. Combine all the miso marinade ingredients and stir well to dissolve the sugar and then put half in a large dish. Take a piece of muslin or j cloth which is double the size of the dish and lay one half of the length in the dish with the marinade. Next, pop in the fillets skin side down and cover with the cloth. Add in the remaining half of the marinade and cook in the fridge for at least 3 hours or overnight if you can. The cloth allows the flavours to permeate but will minimise the risk of the salmon catching when cooked as without it the sugar will burn when cooked. 2. When ready, preheat the oven to 180c/ 160 fan. Remove the salmon from the marinade and shake off any excess marinade before placing on a baking tray. The salmon can also be grilled if you prefer. Cook for 15 minutes until just cooked through and get on with the noodles in the meantime. 3. Boil the noodles until they are two minutes from ready. In a small bowl add all the stir fry dressing ingredients. Heat a splash of groundnut or vegetable oil in hot wok and fry the garlic and ginger until fragrant. Add the vegetable for a couple of minutes before the dressing goes in and cook for a further minute. Next up goes the noodles and toss the wok so all ingredients combine. Cook until heated through and the noodles are tender. 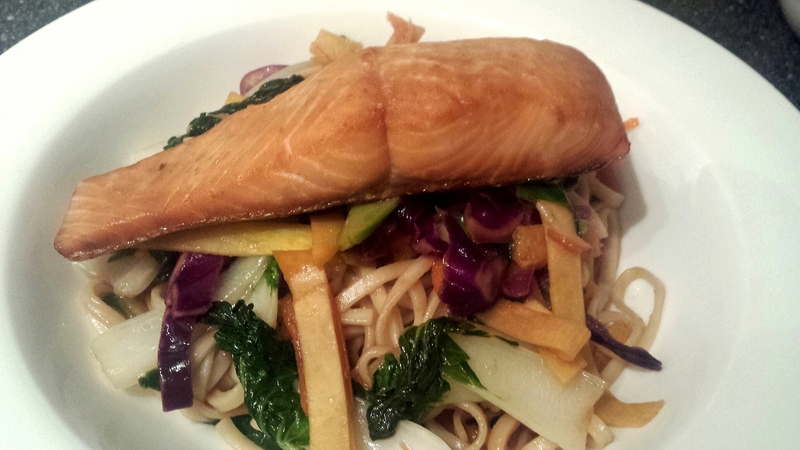 Serve in large bowls with the salmon perched atop a bed of delicious noodles. 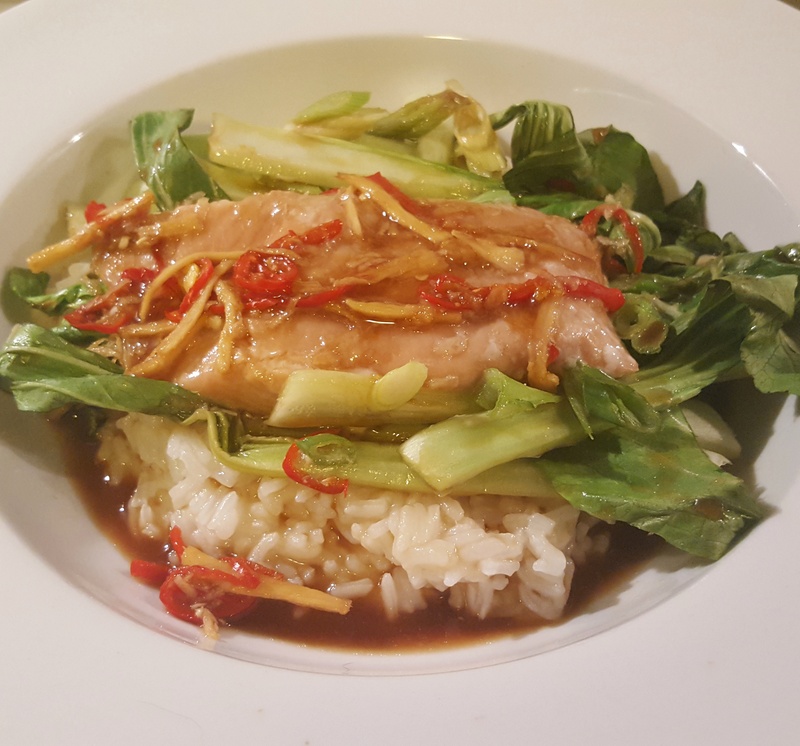 Miso marinated salmon- a perfect taste of Japan!